A tub of Suan cai made from Chinese mustard. Suan cai (also called suan tsai and Chinese sauerkraut; literally "sour vegetable") is a traditional Chinese pickled Chinese cabbage, used for a variety of purposes. Suan cai is a unique form of pao cai, due to the ingredients used and the method of production. An alternative name for suan cai is xian cai (hsien tsai; literally "salted vegetable"). 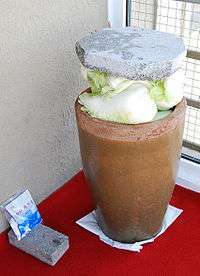 A heavy stone which is placed on the Chinese cabbages put in the large pot will sink naturally in a few weeks as the fermentation begins. Salt, seen in the little plastic bag in the lower left corner, usually is the only additive used. Northern China has used Napa cabbage (Chinese: 大白菜; pinyin: dà bái cài) as the traditional vegetable of choice. Southern China uses the thick stalk varieties of Chinese mustard (Chinese: 芥菜; pinyin: jìe cai; Jyutping: suen choy) variety to make suan cai. Production of suan cai differs from other pao cai in that the vegetable is compressed. This is accomplished by placing a heavy weight such as a large rock on top of the cover of the container so that the Chinese cabbage inside the container is slowly pressed and fermented. The processing of the vegetable helps to create a distinct flavor. Suan cai is often used in cooking with meat, especially pork. It is said to neutralize the grease of meat. In Chinese Islamic cuisine, suan cai can top off noodle soups, especially beef noodle soup. In Hunan, suan cai is frequently made with ginger and chilies (typical of Hunan cuisine). In Cantonese cuisine, it is served in a small dish, often as an appetizer, and usually free. Sometimes it can be available in mini-containers on the dining table. There are also Cantonese variations such as salted suan cai (鹹酸菜). In Northeastern Chinese cuisine, suan cai is made from napa cabbage or head cabbage and has a taste similar to sauerkraut. As part of the cuisine in Manchuria, it is used with dumplings and boiled, or stir fried. More frequently, saun cai is used to make suan cai and pork stew. In hot pot cuisine, it is often one of the ingredients. Two styles of khao soi. Pickled cabbage is used as a condiment with the curry version of khao soi. Suan chai has also been incorporated into Thai cuisine, where it is known as phak kat dong when only the upper stem and leaf are used'. Most often used in Thai-Chinese dishes, it can also be served as an ingredient in a Thai salad, or as a condiment such as with khao soi, a northern Thai curry-noodle soup. The chopped sour leaf and upper stem is combined with scrambled egg in the dish pak khat dong pat kai. When the dish includes only the main stem and tuber of the cabbage (in the style of zha cai), it is called chee chuan chai in Thai. Suan cai is similar to a fermented-cabbage dish, sauerkraut, which is common in the cuisines of Central and Eastern Europe. A popular sitcom and namesake song depicting lives in Northeast China Cui Hua Shang Suan Cai (翠花，上酸菜, literally "Cui Hua, serve the suan cai") debuted in 2001, and the phrase Cui Hua Shang Suan Cai became a popular catch phrase. Cui Hua became synonymous with a person from Northeast China. A company in China registered "Cui Hua" brand packaged suan cai.